The Virgin Martyr Theodosia of Constantinople lived during the eighth century. She was born in answer to the fervent prayers of her parents. After their death, she was raised at the women's monastery of the holy Martyr Anastasia in Constantinople. St Theodosia became a nun after she distributed to the poor of what remained of her parental inheritance. She used part of the money to commission gold and silver icons of the Savior, the Theotokos, and St Anastasia. When Leo the Isaurian (717-741) ascended the imperial throne, he issued an edict to destroy holy icons everywhere. Above the Bronze Gates at Constantinople was a bronze icon of the Savior, which had been there for more than 400 years. In 730, the iconoclast Patriarch Anastasius ordered the icon removed. The Virgin Martyr Theodosia and other women rushed to protect the icon and toppled the ladder with the soldier who was carrying out the command. Then they stoned the impious Patriarch Anastasius, and Emperor Leo ordered soldiers to behead the women. 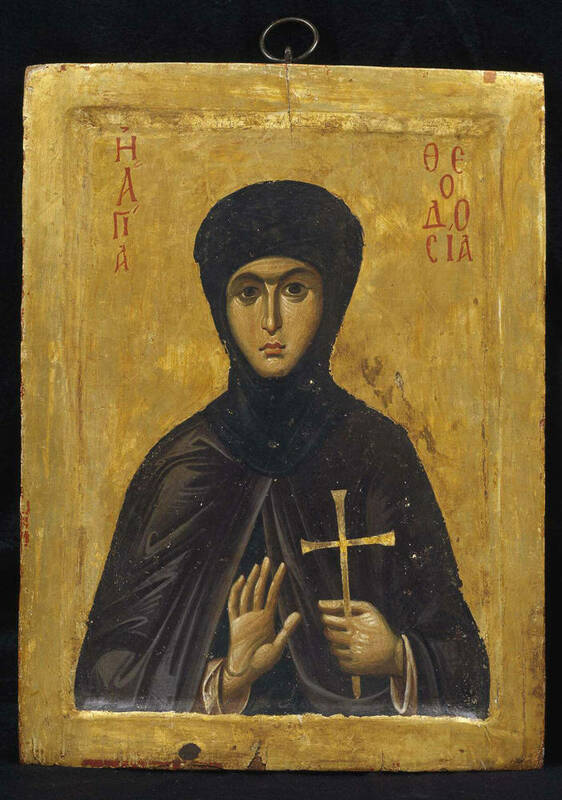 St Theodosia, an ardent defender of icons, was locked up in prison. For a week they gave her a hundred lashes each day. On the eighth day, they led her about the city, fiercely beating her along the way. One of the soldiers stabbed the nun in the throat with a ram's horn, and she received the crown of martyrdom. The body of the holy virgin martyr was reverently buried by Christians in the monastery of St Euphemia in Constantinople, near a place called Dexiokratis. The tomb of St Theodosia was glorified by numerous healings of the sick.